The DEWALT Variable Speed Top-Handle Jigsaw Kit provides you with the power, precision, and innovative features you need for detailed work and curved cuts. To make fast, accurate work of tough jobs, this jigsaw kit features variable speed control in the dial and trigger, positive bevel detents on the shoe at commonly used angles, and integrated dust management. Plus a counterbalance mechanism and rubber grip minimize vibration to help keep you in control of the saw and your workpiece. Includes a durable kit box for easy transport. The jigsaw's variable speed control allows you to make quick, accurate adjustments and utilize speeds ranging from 500 strokes per minute to 3,100 strokes per minute. Keyless level action blade clamp for quick and easy blade changes. This application-specific performance translates to improved control and cleaner results. Adding to the saw's application-specific performance is a four-position orbital action for quicker, more aggressive cuts. The saw delivers a 1-inch stroke length, and its dependable 6.5 amp motor provides the power you need for tough applications. And when you're working with more delicate materials, a plastic, non-marring shoe cover protects soft or glossy materials from unwanted scratches. 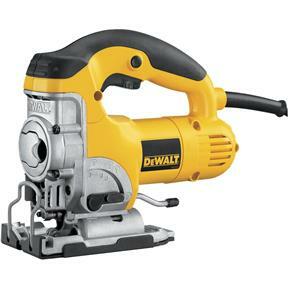 In addition, the innovative DEWALT flush-cutting blade system allows you to complete flush cuts without up cutting. And positive bevel detents at 0, 15, 30, and 45 degrees make it a cinch to accurately set the shoe and blade at commonly used angles. This easy-to-maneuver jigsaw weighs just 6.4 pounds, but that doesn't mean it compromises on dependability or comfort. An all-metal gear case provides the durability necessary in a professional shop environment, while a counterbalance mechanism reduces vibration and an extra-large rubber grip dampens it. This results in improved user comfort and reduced user fatigue, allowing you to work longer and produce work with precision. The saw's integrated dust blower helps keep your work surface clear of unwanted debris, resulting in a safer work environment. It is designed to keep your line of sight clear for improved work piece visibility while you cut. Please note: due to the high incident of fraudulent transactions with orders containing power tools, orders for this item must ship to the billing address.